Photo above:(L-R) Assemblyman Nelson Castro; Jay Hershenson, CUNY senior vice chancellor and secretary of the Board of Trustees; Assemblywoman Vanessa Gibson; Philip A. Berry, vice chairperson, CUNY Board of Trustees and acting chairperson of the CUNY Construction Fund; President Carolyn G. Williams; Allan Dobrin, CUNY executive vice chancellor and chief operating officer; Iris Weinshall, CUNY vice chancellor for facilities, planning, construction and management. 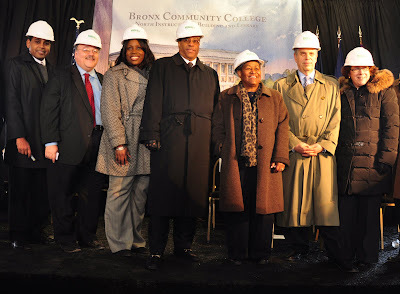 Bronx Community College held a "Topping Off" ceremony in celebration of its new building last Thursday, Jan. 21. BCC President Carolyn G. Williams, along with elected officials and CUNY staff, welcomed the construction of the North Instructional Building and Library, BCC's first new construction since its move to campus 40 years ago. The college has faced issues of overcrowding, and Williams cited BCC's current enrollment of 11,000 (and counting): "A new building is a necessity<" he said. "We need classroom space and we need a library - we need facilities which enable our faculty to teach and our students to learn." The North Instructional Building and Library will be home to 15 large classrooms and a small cafe on the first floor. The second floor will house group-study rooms and lounge seating. The topmost level will have book stacks overlooking the reading room below. Also included in the $102 million, 98,000-square-foot building is a two-story information commons.Clerestory windows will bring in a flow of natural light and provide views of the campus, the Cloisters and the Henry Hudson Bridge. Those in attendance at the ceremony were Assemblywoman Vanessa Gibson and Assemblymen Nelson Castro and Michael Benjamin; Jay Hershenson, CUNY senior vice chancellor and secretary of the Board of Trustees; Iris Weinshall, CUNY vice chancellor for facilities, planning, construction and management; Philip A. Berry, vice chairperson, CUNY Board of Trustees, acting chairperson of the CUNY Construction Fund; Paul T. Williams, Jr., executive director of the Dormitory Authority of the State of New York and Bronx Community College Foundation Board members. President Williams expressed her appreciation for the help of the State Assembly and Senate, the Bronx Borough President's Office, New York City Council members and CUNY staff. Williams then joined Allan Dobrin, CUNY executive vice chancellor and chief operating officer, in the ceremonial signing of a beam to symbolize the vision and the struggle to reach the "topping off" stage of construction when the last beam is hoisted at the top of the building. 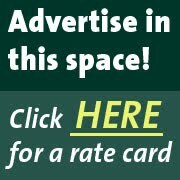 The ribbon cutting ceremony is slated for sometime in 2011.